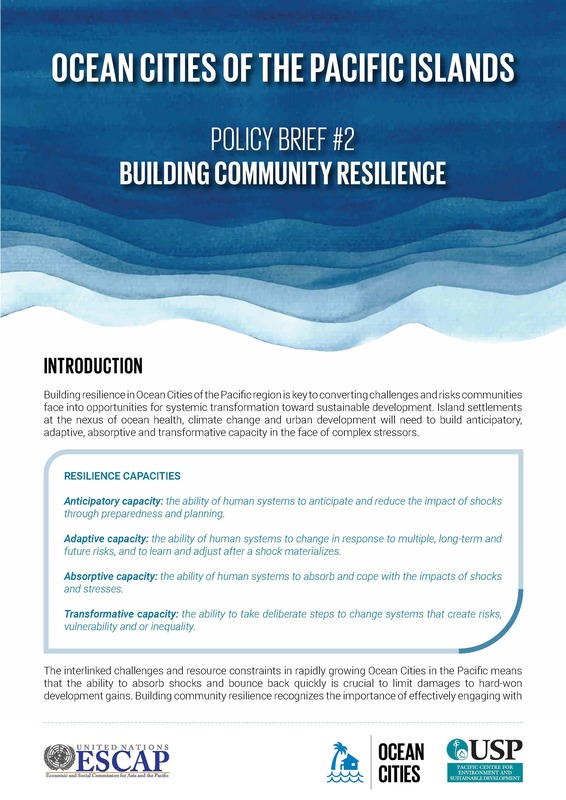 Building resilience in Ocean Cities of the Pacific region is key to converting challenges and risks communities face into opportunities for systemic transformation toward sustainable development. Island settlements at the nexus of ocean health, climate change and urban development will need to build anticipatory, adaptive, absorptive and transformative capacity in the face of complex stressors. relevant partners and stakeholders to promote equitable opportunities for all people in urban communities to access resources and use them sustainably, and to apply standardized methods contextualized for the Pacific to assess the relative vulnerability of communities in Ocean Cities. It also recognizes the importance of promoting stronger governance regimes within urban communities, aligning these with the policies of local government, and encouraging partnerships between urban and rural communities. This second policy brief in the Ocean Cities series offers guidance in this direction.